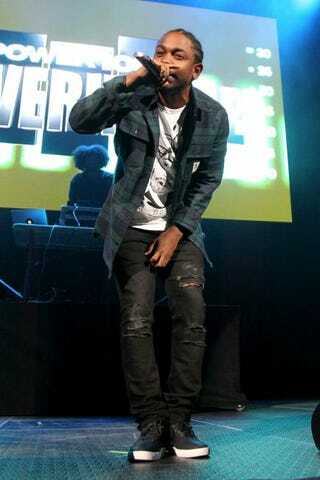 Kendrick Lamar performs onstage in Brooklyn, N.Y., Oct. 22, 2015. Kendrick Lamar is waking up to 11 Grammy nominations Monday. The rapper is in the running for 11 awards, including Album of the Year for To Pimp a Butterfly and Song of the Year for “Alright,” according to the Associated Press. Included in Lamar’s nominations are Best Rap Album for Butterfly; Best Rap Performance for “Alright”; Best Pop Duo/Group Performance for “Bad Blood,” with Taylor Swift; and Best Dance Recording for “Never Catch Me,” with Flying Lotus. Joining Lamar in racking up nominations is the Weeknd, whose nominations include Best Pop Solo Performance for “Can’t Feel My Face” and Best Urban Contemporary Album for Beauty. His Fifty Shades of Grey song, “Earned It,” was nominated for Best R&B Performance, Best R&B Song and Best Song Written for Visual Media. This year’s most anticipated comeback album, Black Messiah, by D’Angelo was nominated for Best R&B Album, with a song from the album, “Really Love,” nominated for Record of the Year. And everyone’s favorite Dad Dancer, Drake, has a couple of nominations under his belt, including Best Rap Album for If Youre Reading This Its Too Late. The Grammys are set to air live Feb. 15. Go here for the full list of nominees.